Pondberry is a colony-forming shrub growing in low, wet woods. Spreads via runners. Leaves are simple, alternate, drooping; aromatic when crushed; 2–6 inches long, oval with tapering, pointed tip, narrowing toward the base, untoothed, thin, and rather translucent. Both surfaces dark green; lower surface slightly hairy. Bark is brown to dark gray, aromatic when bruised. Twigs are slender, reddish-brown to gray, hairy at first, smooth later. Flowers March–April, before the leaves; pale yellow, fragrant, about ¼ inch wide, in clusters of 4–6 along the stem. Male and female flowers on separate plants; petals absent. Fruits September–October, solitary or in small clusters; somewhat elongated, about ¼–½ inch long, bright red, spicy, 1-seeded. Similar species: Spicebush is much more common, living in damp woods and in cultivation; its leaves do not droop and are bright green above and whitish below; the twigs often bear leaves of two sizes, with much smaller leaves at the base of larger ones. Poorly drained, swampy depressions associated with small sand dunes. These depressions are typically under a foot of water in the spring but are dry by autumn. To save this plant from extinction, its wetland and bottomland habitats are receiving protection from draining, grazing, and development. Researchers are studying the reproduction and seed-dispersal of this species, looking for more populations and trying to reestablish pondberry in areas where it might survive. In Missouri, pondberry is found only in Sand Ponds Natural Area and Conservation Area in Ripley County, in the Missouri Lowlands Region. It also hangs on in some other scattered locations in the southern United States. 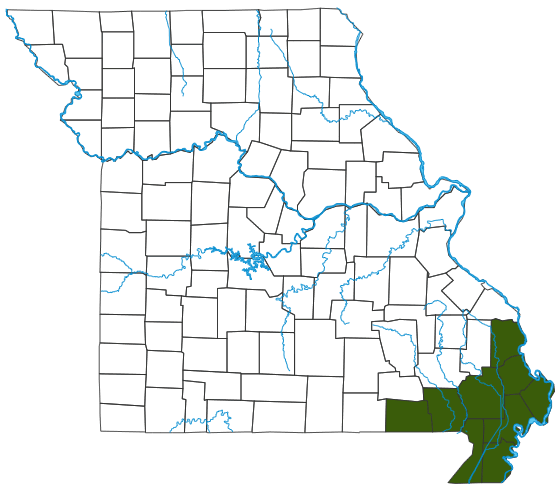 Listed as Endangered by both the Missouri Department of Conservation and the U.S. Fish and Wildlife Service. Pondberry has declined due to destruction of the habitat it requires. It survives today in the lone remnants of its original habitat: a forest-covered dune-swale (pond) complex. Fortunately, these remnants are currently protected as public lands. Most of this unique ecosystem has been converted to agriculture; in the 1930s and 40s much of the cultivated area was seriously wind eroded. In days when pondberry (and its habitat) was more common, people sometimes brewed the twigs into a tea and drank it as a spring tonic. It's worth noting that many of our drugs come from plants, and that if we lose a species forever, we lose any potential medicine it might have provided. Several species of birds and mammals eat the fruits, and the swamp rabbit (itself an imperiled species) nibbles on the stems and leaves. Spicebush swallowtails use pondberry, and its relatives spicebush and sassafras, as food plants.